At St. Werburgh’s Park Nursery School we will provide opportunities for children to develop their mark making skills alongside their gross and fine motor skills. We link Marking Making and Writing together with the Physical Development curriculum strand as we believe the two are intimately linked. A child needs to gain upper body strength, strength in arm and wrist followed by a controlled pen grip, in order to write. Regular observations in children’s Learning Diaries within the areas of Literacy and Physical Development will provide a clear picture of where each child is at in relation to mark making. Where marks develop and become emergent writing and the spelling of short words, mark making will become linked with Phonics, in order to teach the linking of sounds and letters. Phonics is an essential strategy though not the only strategy which supports children to become fluent readers and writers; a love of reading and enjoyment of making marks also underpin this. We celebrate the journey each child makes from mark maker to writer, valuing each child’s work, showing interest and praising process and product alike. Adults model purposeful writing and mark making throughout the year; writing lists, letters, modelling name and caption writing. 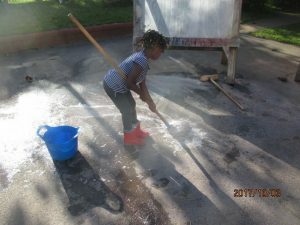 When they are ready, we encourage children to ‘have a go’, giving them self-confidence to try, appreciating what they have done. 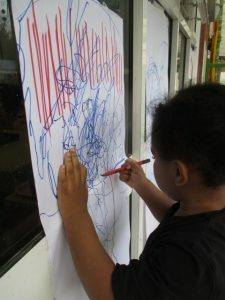 At home, children can be supported with their Writing Development. 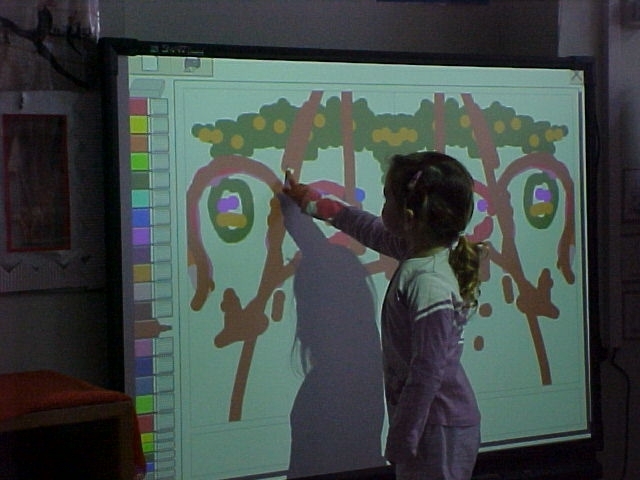 There are many stages to consider before we encourage a child to use a pen and paper. These simple stages of development can help us understand the basic progression from large mark maker, to intricate writer, along with a few suggestions of things you might try. STAGE ONE – SHOULDER PIVOT: (most mark makers start here…) Build up strength in shoulders. Let them help you carry the shopping, go to the park and encourage them to swing off climbing equipment. STAGE TWO – ELBOW PIVOT: Large scale painting upright if possible. Get any large carboard boxes or packaging you have and put outside or on a wipeable mat inside with paints. Chalking up and down, side to side motions on pavement. STAGE THREE – WRIST PIVOT: Build up fine motor strength in wrist and fingers. Use playdough/ clay/plasticine to roll, twist, poke, pull, pat, etc. Finger gym exercises e.g. threading pasta necklaces, using tongs to pick up marbles and put in containers; using washing pegs to peg around the home, etc. Ask questions about their marks. It may not look like more than a few lines to you, however showing an interest and opening dialogue about children’s work can show you their intention and reasoning. Model writing for a purpose – a shopping list, or a thank you card. They can make marks with you, perhaps drawing three circles/dots to represent the three apples you need.